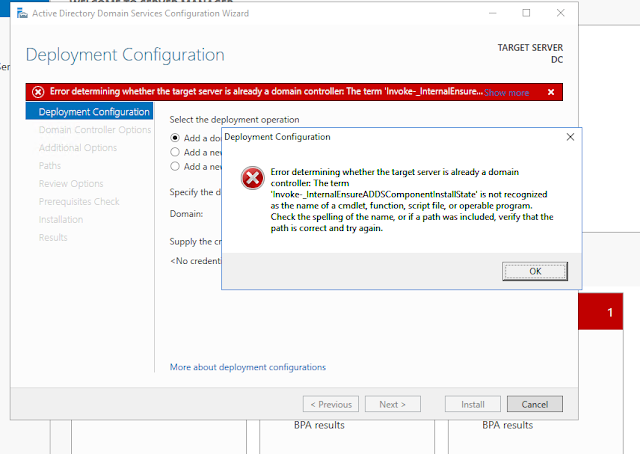 Error determining whether the target server is already a domain controller. I found above error (Below in screenshot) while doing active directory installation on Windows 2016. As the windows server 2016 is in technical preview stage there are lot of bugs we have seen with windows 2016. I though this will be very important because everyone need to see how I have resolved this problem. I got this error while doing Post install configuration of active directory. 1) I tried removing roles and features from server manager but dint help. 5) and successfully installed the AD. in my RCA I found that Dot Net 3.5 was causing problem because it was not allowing server to validate if its already a domain controller or not. Commands were not executable so I removed it & rebooted the system & its worked for me. Let me know if you have any other issue so we can update it to MS.